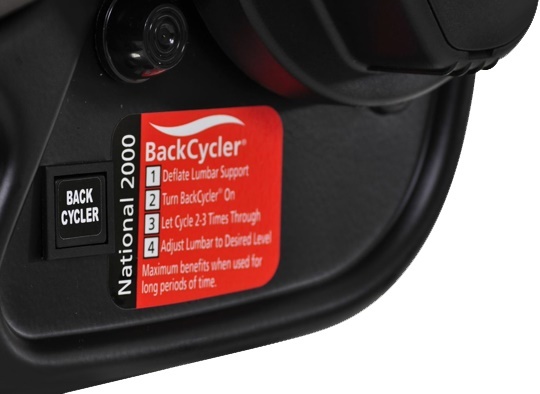 The BackCycler® system cyclically inflates and deflates an air bladder in the lumbar area of the seat. This slow and slight movement in and out, as the bladder fills and deflates causes your lower back to slightly adjust on a continuous, cyclic basis. This helps keep blood flowing and keeps muscles and ligaments from stiffening. The BackCycler® was developed from 10 years of research with the University of Vermont and funded by the National Institute of Disability and Rehabilitation Research. Today many fleets will only purchase vehicles with BackCycler® as a standard feature on their new trucks. It isn't just about feel good, it is about the bottom line.